Silicone wristbands are very popular and very effective marketing tool that helps to catch people's attention in a fun and stylish way. Our silicone wristbands, custom silicone wristbands are mostly used not only to raise awareness and support different charitable projects or organizations but also as advertising accessory for different projects, concerts and festivals, or they can also be used as memorabilia from an unforgettable event that you visited. Custom silicone wristbands can also be a symbol of membership uniting like minded people, businesses or different organizations. An example would be schools, universities, colleges, sports teams or clubs. These days silicone bracelets have become more than just an advertising tool and with wide choice of customization options available, custom silicone wristbands have become as stylish fashion accessory not only among teenagers but also among adults, and that is the reason why more and more organizations around the world choose custom wristbands. Please take time to browse through the tabs to find out more about our custom silicone wristbands. 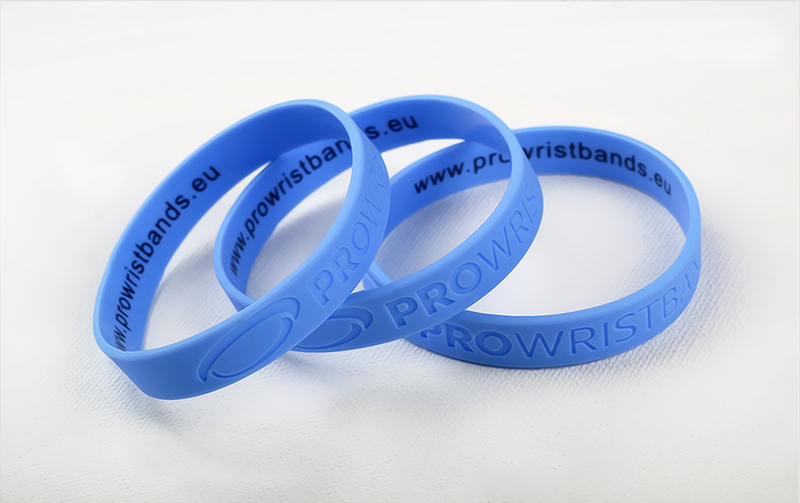 Silicone wristbands are available in a choice of different types that are different to one another in a way your design is incorporated on the wristband. We offer our custom silicone wristbands in a range of different widths to suit different age groups or preferences. Standard width of custom silicone wristband is 12mm, in the meantime we also offer rubber wristbands that are twice the size - 25mm. Each of these sizes have further 3 options where you can choose the wristband to suit child, teenager or adult. We also have glow in the dark wristbands that will be visible during the dark hours of the day. 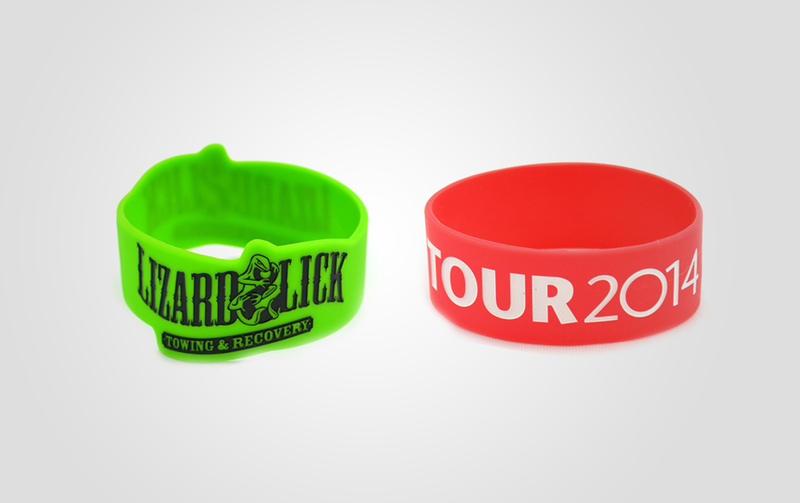 These silicone wristbands are especially popular among concert and festival organizers. We also offer double layered wristbands where colour of each layer can be chosen in different colour, segmented wristbands where multiple colours can be chosen for one wristband and swirl wristbands - for those who love to mix it up to achieve unique and colourful finish. 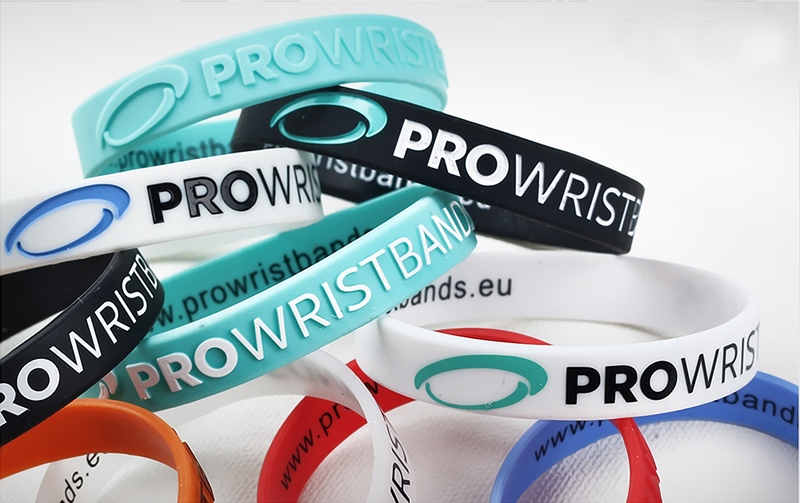 All of these silicone wristbands can be incorporated with your text or logo by using different design processing methods. Please read further to find out more. 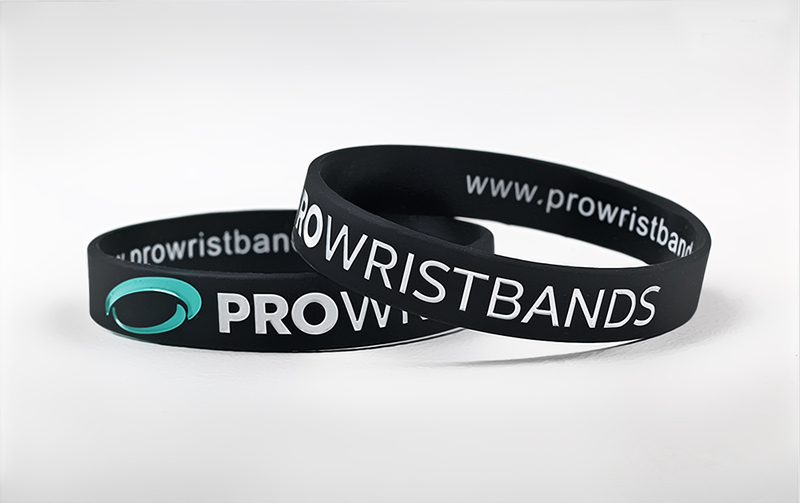 One of our absolute advantages is that the methods that we are using to incorporate your design on the wristband are suited for this purpose and the machinery that is being used is certified and managed by skilled and experienced team. We can offer you multiple colour printing using the quality silkscreen printing method or you can have your wristbands debossed or embossed with your logo or text engraved or raised above the custom wristband surface. Additionally to engraving or having your design embossed we can also offer very accurate printing ensuring that the colour of your design is in contrast to your custom wristband colour. All of our custom wristbands are available in any pantone colour, please visit the specific product page, fill out the product form and pick your favourite colour. We will always seek your approval before proceeding to production process to ensure that you are satisfied with the choice and colours offered - or if you would like us to design your custom wristband, let us know - we will do it for you for free. 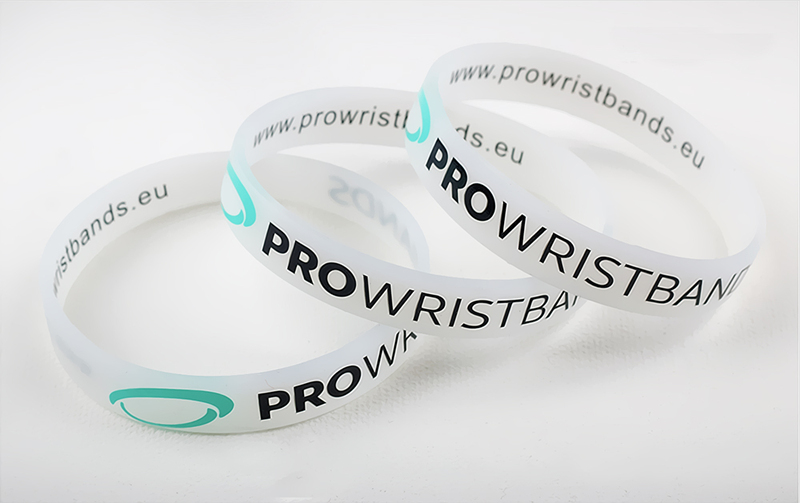 Depending on the wristband type, quantity and the complexity of your design, we will guarantee to deliver your order between 3 and 4 weeks. Depending on the season and in exceptional circumstances we can deliver your silicone wristbands in 1 weeks time, however we really want to encourage our clients to notify us as much in advance as possible to ensure your order reaches you on time. All deliveries are being handles by DPD International delivery service. Delivery to Estonia and Lithuania are free on all orders. Please visit your desired product page, fill out the price calculator and the approximate delivery date will be displayed to you. Any questions, let us know, we are here to help. We currently offer delivery to Lithuania, Estonia, Poland, Austria, Belgium, Czech, Denmark, Luxembourg, Netherlands, Slovakia, Finland, Germany, Sweden, France, UK, Slovenia, Croatia, Hungary, Greece, Bulgaria, Italy, Portugal, Spain, Ireland and Romania. 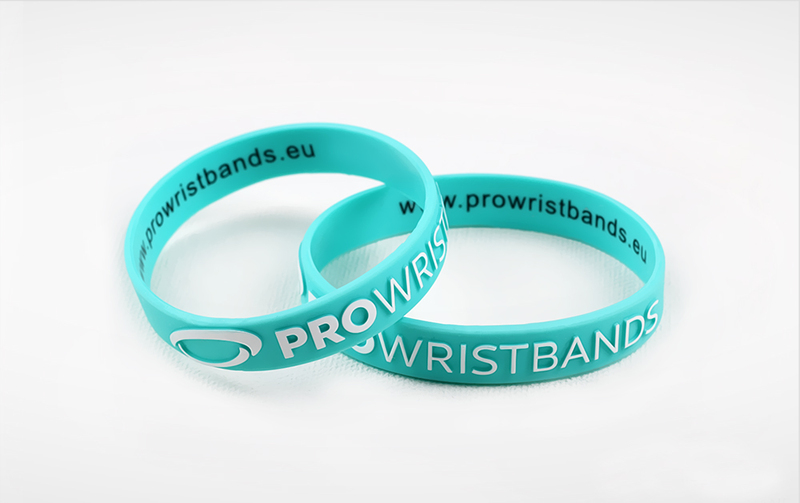 Debossed silicone or rubber bracelets are the most popular wristband type among all of our silicone bracelets. 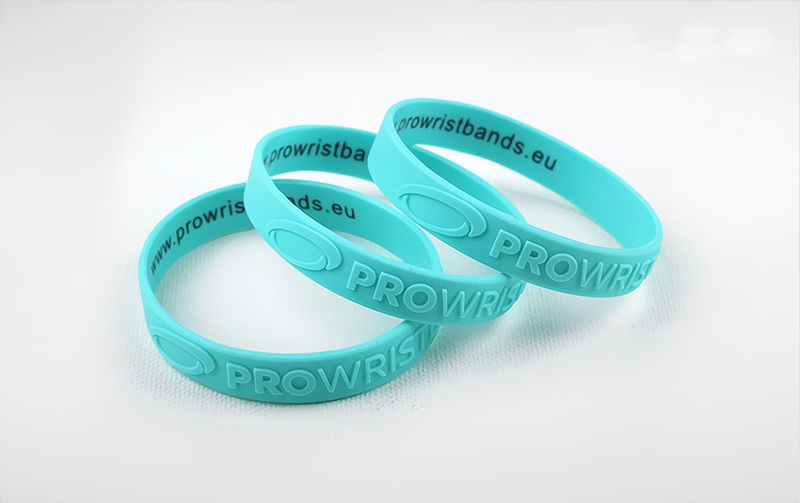 The design is being engraved into the wristband surface, creating long lasting effect. This wristband is available in any pantone colour. Debossed colour filled silicone bracelets means that your design is being engraved into the wristband itself and filled with single or multiple colours of your choice. This wristband is also available in any pantone colour. Embossed silicone wristbands are definitely on top of our clients preference list. Design on this bracelet is being embossed, meaning you text or logo will be raised above the wristband surface. This custom silicone bracelet is available in any pantone colour. 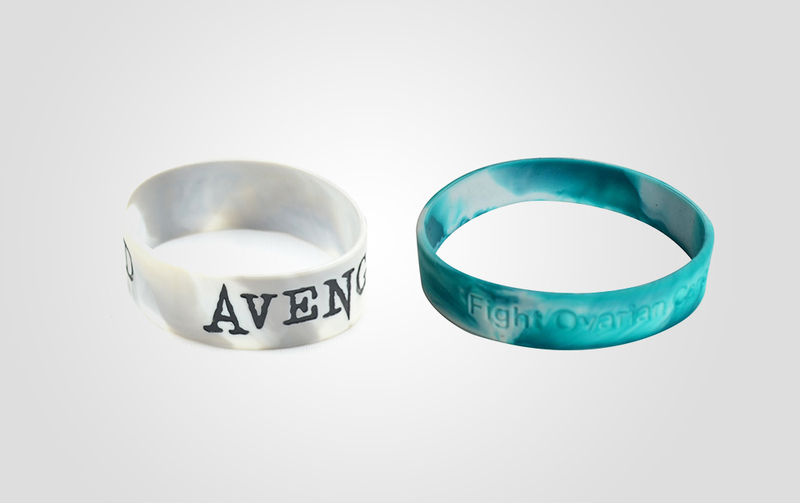 Embossed printed silicone bracelets represent both - quality and accuracy. In addition to the embossed design, it will be very carefully printed with single or multiple colours using the quality silkscreen printing method. Printed silicone bracelets are being customised using the very quality silkscreen printing method which offer wider customization options when it comes to more detailed designs. We offer single or multiple colour prints on our printed silicone bracelets. Glow in the dark silicone wristbands main quality is that in the dark they obtain a glowing bright green colour. Glow in the dark bracelets are available at different sizes, colours, with silkscreen imprint, embossed or debossed design. 1 inch silicone wristbands main benefit is its width (25mm) which means that the print area is equally twice as big as for the standard size bracelet. 1 inch silicone bracelets are available embossed, debossed or printed in single, multiple or in full colour. Segmented silicone wristbands give you the opportunity to choose two or more colours and lay them out on a single custom wristband in segments. 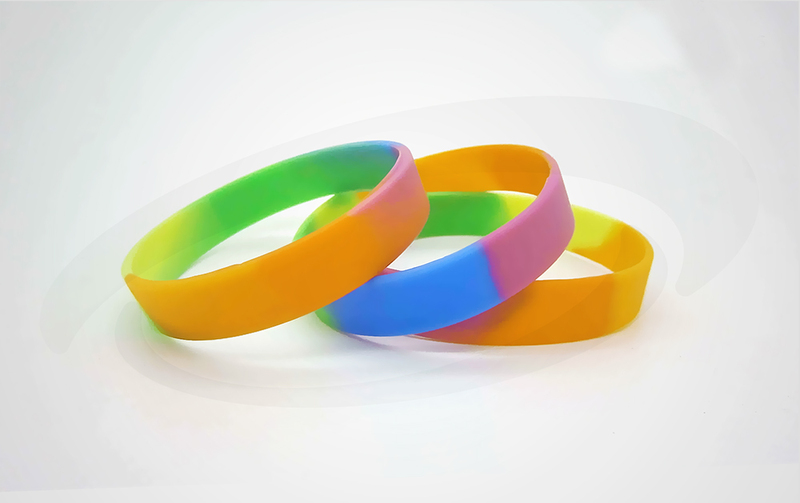 Segmented silicone bracelets are available at different sizes, printed, embossed or debossed. Swirl silicone wristbands give you the opportunity to choose and swirl two or more colours and apply the swirled colour mix on a single custom wristband. Swirl silicone bracelets are available printed, debossed or embossed with your text or logo.